Thank you for posting your query.Our experts will get back to you soon. For a successful retirement plan & emergencies fund, there can be multiple options. But in my opinion following can be important steps in planning for retirement & keeping funds for emergencies:- Set your retirement goal: Estimate fund requirement for financially independent retired lifestyle, considering your present cost of living & effects of inflation. Start early: The sooner you begin the investment process, the better. The power of compounding always plays an important role in building the corpus. Systematic investing: Systematic investment adds discipline to investment & also provides advantage of the rupee cost averaging. Diversify: Choose the right mix of assets (equity, debt, gold, and others) in your investment portfolio so that the risk-reward ratio can be optimised. Establish a contingency fund: Emergencies can arise at any time and requires immediate need of money. To be ready for emergencies one should maintain three months of household expenses as emergency fund in liquid assets as they are easily available. Review and rebalance: Review investments periodically to make sure that these are on track. How to save 1 crore for grandchildren? 1. Consistently investing Rs 1427 p.m. for 30 years at a rate of 15% will help you create a 1 Crore Corpus for your grandchild. 2. If you want to consider investing only RS 1078 p.m., your investment must generate an annualized return of 16.25% to create 1 Crore in 30 years. At the same time, if you want to conservatively estimate a return of 13.6% p.a for, (a more feasible estimate considering India’s macro-economic factors and GDP growth), you may accumulate RS 2000 p.m. to create the same corpus. 3. To diversify Business risk adequately, it is recommended to invest in Equity Diversified Funds. The SIP route will ensure you diversify and average the market risk. 4. Yes, investment in the name of a minor is possible through his /her own bank account, and operated by the father or mother as the guardian. 5. Steady and continuous investments, with the recommended amounts have been suggested above. However, periodic stepping up of SIP’s also helps you achieve the corpus. Starting your SIP with Rs 1026/- in 1st year, and growing the contribution annually by 11%, helps you achieve 1 Crore corpus in 30 years. 6. Approach a qualified financial advisor who will help you with the necessary paperwork to initiate a direct deduction of the monthly SIP from the bank account. Registering a mutual fund KYC with pan copy, photo and address proof are pre-requisites to investing. 7. Diversified, Open-ended, equity scheme are the best available options for long term goals. They are open ended and readily available. However, all investments initiated within last 12 months are subject to exit charges and tax implications. Mistakes most women do when invest? It’s part of our life but we all do mistakes 1. Letting someone else handle the finances and investments – Women are experts in daily money management and can do the same when it comes to investment and asset building. 2. Quit Job losing financial independence – Quitting job is not the end of it all but can be constructive in self-employment as well household responsibilities. 3. Women tend to avoid investment related decisions – It is for the fear of going wrong, women avoid investment related decisions. The woman can be of major help to her spouse. 4. Not building assets of your own – Saving money in almirahs and investing in jewellery is not enough. Women should go beyond that and learn latest techniques to further build her assets while diversifying her portfolio for future needs. 5. Children are priority – Children are every mother’s priority, but a woman should also save for her own future. 6. Couples don't discuss their finances until something goes terribly wrong – There should be financial intimacy and mastery of finances between partners. Estimate fund requirement for financially independent retired lifestyle, considering your present cost of living & effects of inflation. Start early: The sooner you begin the investment process, the better. The power of compounding always plays an important role in building the corpus. Systematic investing: Systematic investment adds discipline to investment & also provides advantage of the rupee cost averaging. Diversify: Choose the right mix of assets (equity, debt, gold, and others) in your investment portfolio so that the risk-reward ratio can be optimised. Establish a contingency fund: Emergencies can arise at any time and requires immediate need of money. To be ready for emergencies one should maintain three months of household expenses as emergency fund in liquid assets as they are easily available. Review and rebalance: Review investments periodically to make sure that these are on track. I am a customer of UTI. I have started an SIP in UTI hybrid equity fund. As it is a debt oriented fund , why it is out performing? I would like to invest Rs.35,00/-annually for tax savings under section 80 C.
Read a lot. Read books on basics of stock market, how it operates, annual reports of companies, management's interview and apply your financial judgement while making any investment decision. 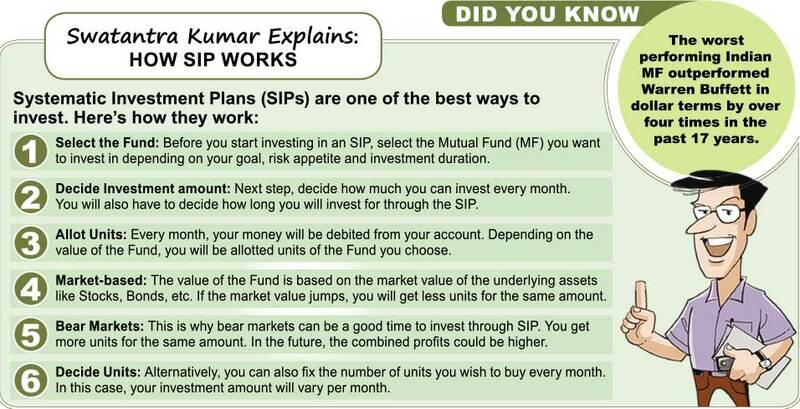 Sir i want to start SIP for the amount of Rs 1000 but did not have much knowledge about this bcoz i am investing first time in mutual funds please help me that which is better for Wealth creation like open sceheme or close or short or long there are so many companies in this please also send name of some good companies to invest. As a layman, you can relate SIP to Recurring Deposits 'RD'). So RD is where you put certain sum of money in your Bank as FD for a given interest rate. Similarly, SIP is a Systematic Investment into Mutual Funds wherein certain sum of money is invested into Mutual Funds on a given date and given price. Consider this, you are investing into good and quality companies periodically and as these companies do well in their business, the value of your holdings increases. However, you should consider SIPs for long term such as 7-10 years. Get in touch with good financial advisor so that they can guide your parents properly and help you achive your desired results. How can I do a savings for my marriage and future activities where I will need moneyjQuery171020307098450767236_1536040665710 Is PPF,NSC, SIP, Mutual fund appropriate choice? Which is the best to have multiple investments and multiple benefits?? Hi, you need to have all these instruments according to your goals and time frame that you have to achieve them. Ideally, you can include PPF and NSC for your retirement goals. SIPs into Debt Funds/Balanced Funds may help you achieve your short term goals like marriage and other activities. For your retirement, I believe you will have about 20 years for which you can consider mix of diversified funds and small and midcap funds. Also, do not forget to create emergency funds. I am investing in SIPs online through ET money, wealth trust and my cams apps. Please suggest me best apps to invest in direct funds. Also best SIP comparison app. And online investment specialist consultations. Thanks. I believe ET Money shall provide you good tracking of your past investments and also for new investments. For SIP comparison, you may use advisorkhoj.com or valueresearchonline.com. For consultation, I would recommend identify a person near you or search for well established investment advisor and then share your profile with them to help them understand you better and advise accordingly. Thanks.